Creating Engagement Through Discussion Forums - Center for Teaching and Learning | Learning House Inc. Engaging students in the online environment presents different challenges than in face-to-face classrooms. For one thing, online learning often draws more adult leaders than traditional students, and these adult learners respond better to different teaching methods. In addition, conversations in online classrooms take place in an asynchronous environment, which sometimes makes for disjointed discussion. Finally, students who have taken online classes before may have grown weary of the typical “post first, reply to two comments” format of discussion forums. Require students to post first. Sometimes when students are all responding to the same question, their answers can start to resemble each other as students review their peers’ responses before they post their own. To address this issue, you can simply set up the discussion forum so that students have to post their response before they can see others’ posts. Doing so will require students to think about their response, and hopefully discourage students copying thoughts and citations (whether intentionally or not). If you try this method and still get similar responses, it may be because your question is too narrow and is thus yielding a narrow range of responses. In this case, if you have editing power in your course, consider rewriting the question to be broader in scope. Use forums for project feedback. While students are working on projects, encourage them to post parts of their assignment as topics for discussion in the forums. Through an attachment, students can post part of a paper, video, or PowerPoint presentation to ask for peer feedback. To help guide the conversation, students can post questions to each other for the type of feedback they’re looking for. For example, one student may choose to post only the introduction of his or her paper, and ask for feedback regarding the opening. Another student may post a video he or she has been working on, and ask if others know of resources on the topic. If many students are posting the same problems and questions, you’ll know that you need to address that topic again. Have students submit their final projects to the forum. Final course projects are often artifacts worthy of sharing with a wider audience, but many times, only instructors end up seeing them. To solve this missed opportunity, you can require students to submit their final projects to a discussion forum rather than just sending them directly to you. 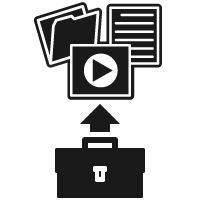 You could have them simply upload the file, or record a video of themselves presenting their papers or PowerPoints. In addition, you could require students to post feedback or questions on one another’s projects, just as you would in an in-person classroom presentation. This practice gives students the opportunity to learn from their peers’ work, and it also inspires students to think about a wider audience as they work on their projects. Students are often much more motivated by having an audience of their peers rather than just their instructor. Have students post the questions and serve as moderator for the forum. To encourage higher-level thinking and more organic discussion, have students post their questions for discussion as the original post and then moderate other students’ responses to it. This type of assignment forces students to think about the material on a deeper level because they must figure out how to assess and respond to questions on the material. It also allows you, the instructor, to see what students are most interested in or confused about. Who says discussion has to be only written? Post a video to encourage a discussion. Have students reply with videos to give the discussion a more in-person feel. Or have students create an infographic of the notes for the chapter or an assigned section, and share with each other for feedback. If you have seen a cool multimedia creation tool, students can use it as the basis for their forum response. This technique taps into Universal Design for Learning because it will appeal to your visual or auditory learners as well. Note: If you decide to try this type of assignment, be mindful of accessibility or technology issues it could create for some of your students, since some pieces of multimedia (such as Flash videos) are not accessible. Use forums for exam study. Before an exam, outline a discussion forum with main topics for the test and assign students to work in virtual study groups. Students may post additional resources, questions from the texts, and study tricks and techniques. You can also clear up any confusion on items before the exam. Host small groups and debates. You can assign students to small groups for more intimate conversations, or assign roles within the discussion so students can focus more on specific issues. For example, if there are two sides to an issue, assigning teams for students to research and discuss can be a valuable critical-thinking exercise. Rather than thinking in terms of post and reply, the discussion could become point and counterpoint, leading to more engagement from students. For courses that have a client or patient focus, role-playing exercises can be valuable experiences for students. You might post patient histories as threads, and have students record a video of themselves explaining a treatment to the patient. You could also assign some students to create scenarios, and other students respond to the scenarios as if they were the client. Practicing a response to a situation is a great way to apply material in a meaningful way. Role-playing can be useful for other subjects as well. For example, in an American history course, you can assign students to reply to discussion prompts in the voice of a certain historical figure. For example, a student playing John Adams might challenge the opinions of his classmate Thomas Jefferson in discussion forums dealing with the issues of slavery or the proper scope of American government. This kind of exercise can result in a very interesting series of back-and-forth replies. Although we often think of discussion forums as venues for simple question-and-answer interactions, they actually offer instructors a wide variety of opportunities to promote engagement in their online classrooms. Whether through simple fixes such as changing the forum settings or through creative assignments such as presentations and role-playing, instructors can use forums to increase students’ interactions with the course’s materials and assignments, leading to greater retention and course satisfaction.